Request an estimate today on the deck of your dreams. 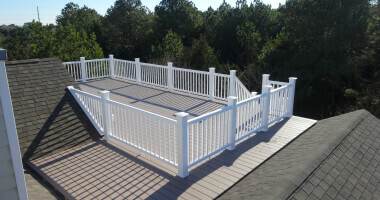 Excel Builders offers premium building services throughout Delaware, and depending on the size of the work, we may also be available for deck building in Maryland. Our service area covers Lewes down to Berlin. We’ve helped many people build their dream decks, and we look forward to helping you, too. Call us when you’re ready to get started. Excel Builders offers a massive range of custom options designed to meet all needs. It’s no challenge for us to build a deck from the ground up, but we can also repair, renovate or improve existing installations. 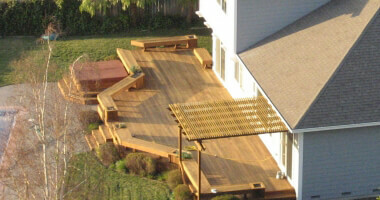 Our deck builders in Delaware can do some interesting things with your choices. Yours can be built out of a range of different, but effective materials. Check out the specs of these common materials to find out which one works best for you. 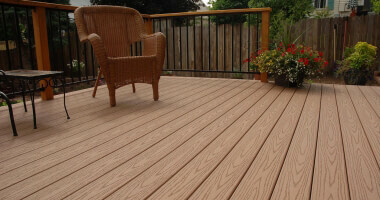 Pressure-treated wood is the most common type of decking material, and the one with the longest history. We’ve been building decks out of this wood for years, and we know how to craft it into the design you want. Pressure-treated wood is often made out of pine, and it is among the most affordable options available. This option is more stable than typical wood decking. Because of its composition, it isn’t prone to warping, expanding or contracting. It also won’t splinter, rot or absorb any water. 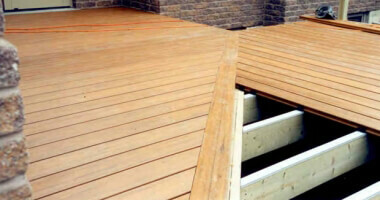 Eliminating these problems means that composite decking is very low-maintenance. 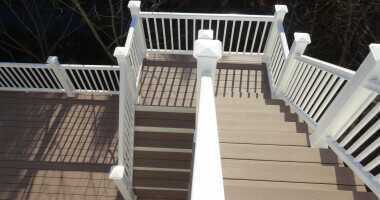 Composite decking has a long life (25+ years) and it comes in a large number of colors. Timbertech is a common brand you’ll see us use, but there are other options. PVC is made from an engineered plastic. It is utterly unfazed by the cumulative water damage that can eat away at most decks built close to water. It’s also highly resistant to scratches, stains and colonization by mildew. PVC decking is often the most expensive option, but absolutely worth it in the right circumstances. Our deck builders have the experience and knowledge to help you find the exact look you want for your deck. Our portfolio includes all kinds of styles and designs, and yours can be one-of-a-kind. 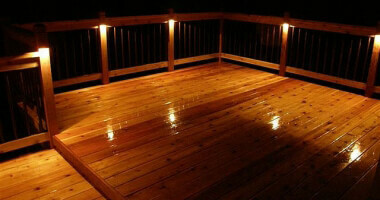 Quality lighting can give your deck and entirely new look, and make it the ideal place for entertaining in the evening. Talk to our deck builders about all the amazing lighting options available. 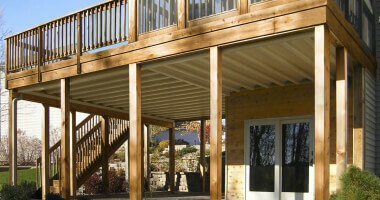 Deck installation is a job for an experienced team, and you’ll find that at Excel Builders. Our expert contractors can handle most any design, including wrap-arounds and multi-story decks. Railing installation on existing decks is a simple matter for our talented team. 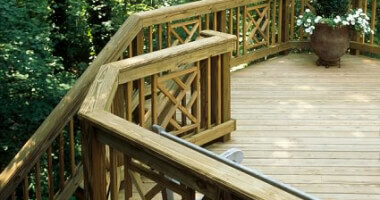 Call us about making your deck safer or more attractive with some quality new railing. 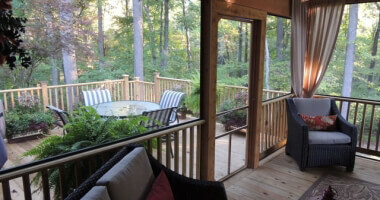 Screened porches offer you privacy and protection from the elements. 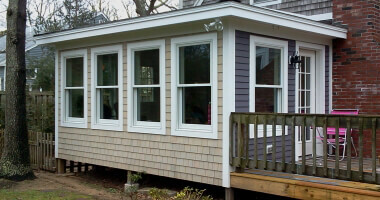 We’ve built many porches in this style, and we’d be happy to help you too. 3-season rooms are an excellent way to enjoy the joys and spectacle of the New England outdoors without leaving the comfort of your home. Call our builders to start planning or building. 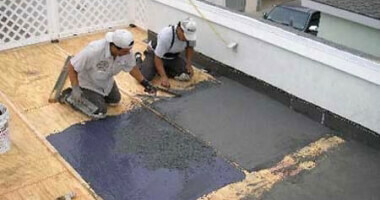 Quality waterproofing is necessary to keep a gorgeous deck looking good. Call us about your situation and needs, and we’ll be happy to tell you how we can help. Effective drainage systems are vital to the health of your deck and any part of the home it’s attached to. Call us to protect your investment into your home. Roof decks are a fantastic option when you want a view. These decks, more than others, should be handled exclusively by an expert team. Our roofing expertise means we know how to build these complex beauties without risking the integrity of your home. If the design is safe, our deck builders can often build it—even if nothing like it has ever been built before. That includes existing designs, designs you’ve created and designs that we’ve created based on your preferences. See our section below on the anatomy of a deck to learn more about each piece you should consider. “Premium” isn’t a buzzword to us. Our construction standards far exceed building code minimums in just about every category. We also use only the most-respected brands and materials for every deck. Hidden fasteners are used with every job to protect the look you want. We have the experience to understand the limitations or defects in any design, and we consider it an obligation to help you understand them. 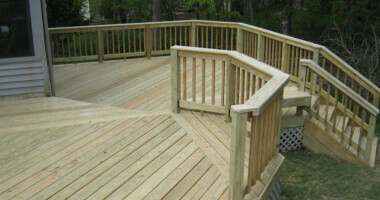 Call us and talk to our expert deck builders in Delaware and Maryland, today.